Home » FOREIGN RELATIONS -- articles only » Products at Center of London Fire Faced Tougher Rules in the U.S.
Products at Center of London Fire Faced Tougher Rules in the U.S.
LONDON — Two products made by American manufacturers that played a major role in the deadly inferno in London had been assailed for their fire risks and faced tighter restrictions in the United States. Such regulatory gaps expose how multinational corporations can take advantage of the vulnerabilities in government oversight. 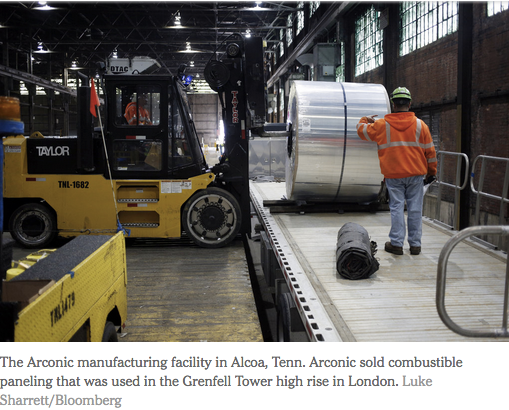 The companies, Arconic and Whirlpool, are widely expected to be central players in litigation over the fire, which killed at least 79 people this month. The Metropolitan Police have also said they will consider manslaughter among other charges; in Britain, corporations can be charged with manslaughter. LONDON — All 75 high-rises in Britain that have been tested for fire safety since the Grenfell Tower tragedy have failed, a leading government official said on Monday, raising concerns that even more buildings may have to be evacuated while emergency repairs are undertaken. Addressing the House of Commons, Sajid Javid, the minister for communities and local government, said all 75 towers in Britain whose cladding had so far been tested for combustibility had failed. He said hospitals and schools would also be tested to ensure they had not been built with cladding that could easily catch fire.